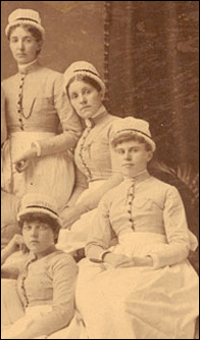 For 116 years, the organization worked tirelessly to improve conditions for student nurses, maintain communications between the school and its graduates, and create a community of graduate nurses that would stretch across Canada and to distant locations around the world. In 2010, the Alumnae Association ceased operations. Throughout its lifetime, the Association’s members had kept scrupulous records and collected a large number of photographs and other material about the school. They recognized this collection provided a wealth of information about the school, the activities of its graduates, and the history of nursing in Canada. To preserve this legacy, the Association donated their collection to the City of Toronto Archives in 2003. Now their records are available to all who visit the Archives. This exhibit provides an introduction to those records. It also provides a brief history of the Association, details some of its activities and explores the impact it has had on nursing, both within the walls of Toronto General Hospital and beyond.